Käserebellen (Cheese Rebels) is an award-winning cheese-making company founded in 1860. They, and their many (about 280) milk suppliers, are located in the middle of the spectacular Austrian/Bavarian Alps. The cows that supply the daily, fresh 100% GMO free milk for Käserebellen’s cheeses are fed exclusively according to “natural hay-milk regulations” – which means they eat only the purest seasonal grasses and hay and the milk is then delivered to Käserebellen in the most traditional manner possible. These strict practices ensure production of the highest quality, all-natural, most extraordinary tasting cheeses. Käserebellen’s Golden Smoked Rebel Cheese further acquires its exceptional character, hearty German Alpine taste and delicious, edible rind from being carefully smoked over a beechwood fire. Full-flavored, Golden Smoked Rebel is also pleasantly mild. Application: Apart from its rightful place on a cheeseboard, Golden Smoked Rebel Cheese slices beautifully and melts with ease for burgers, grilled cheeses, pizza or any recipe that calls for a superior smoky cheese flavor. Wonderful as an ingredient in stuffings for chicken breasts, mushroom caps or pork chops or for incorporation in mashed potato or polenta dishes, it also simply makes a great ham and cheese sandwich. Pairing: Golden Smoked pairs perfectly with a Rauchbier, the German "smoked" beer in which the malt has been dried over an open fire. For wines, try a Riesling or Pinot Grigio. 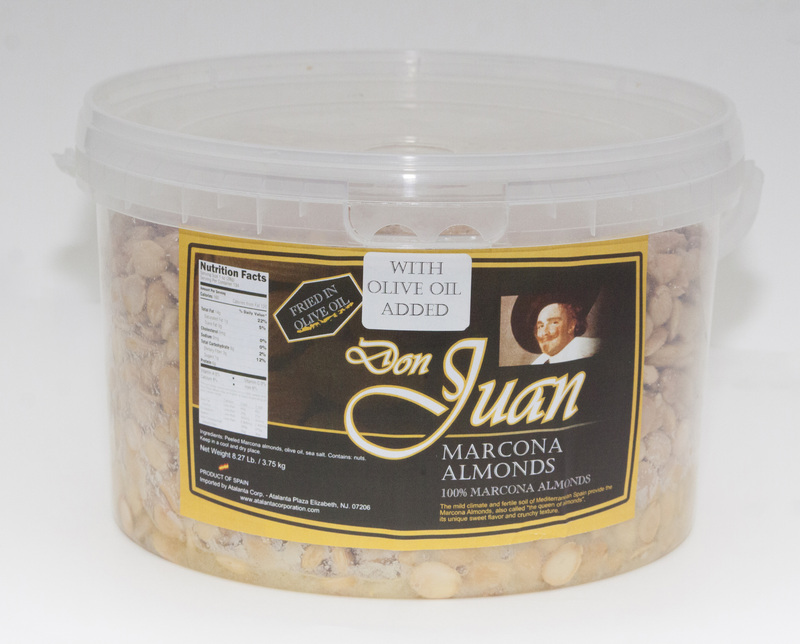 Indigenous only to Spain, Marcona almonds are known as “The Queen of Almonds” and have been treasured throughout their native land for thousands of years. Rounder and plumper than common almonds, it is the distinctively richer, sweeter, more delicate flavor and softer, smoother texture (often described as a cross between an almond and a macadamia nut) that has foodies everywhere hailing the Queen with each addictively creamy, crunchy bite.